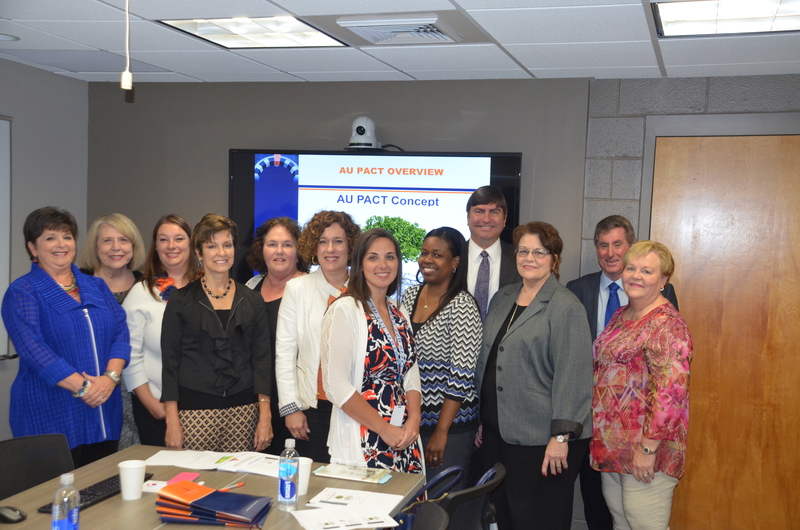 In October, faculty members and graduate students from the College of Education’s Department of Educational Foundations, Leadership and Technology (EFLT) welcomed Alabama State Board of Education members Mary Scott Hunter and Cynthia McCarty to campus. The board members were here to learn about the Educational Leadership Preparation Program’s efforts to develop aspiring “turnaround school leaders” as part of a $2.1 million grant from the State Department of Education. The idea is to find, train, and keep strong principals and school leaders who can successfully lead turnaround efforts in struggling schools and school districts. The grant leadership team, with input from organizations such as UCEA, ISSLC, and the U.S. Department of Education’s Turnaround School Leaders Program, defined turnaround school leadership as “a quick, dramatic, sustained change in performance of a school. Although teachers are the single most important school-based factor in student learning, in low performing schools, the principal’s role is paramount for dramatically improving student performance. Turnarounds do not happen without bold leadership.” (Reform Support Network, 2014). Such leadership often replaces ineffective teachers, lengthens school days, and sets a high bar for achievement and attendance. Following a visit with Dean Betty Lou Whitford, Hunter and McCarty joined several faculty members, graduate students, and education professionals for a presentation led by turnaround experts Associate Professor Ellen Reames and educational consultants Diane Murphy and Debbie Quattlebaum. Part of the presentation graphically demonstrated that, with the exception of 12 urban counties (including Lee County), Alabama is in fact exclusively rural. This alone presents tremendous challenges to our state, as 55 of our 67 counties are rural and frequently lack adequate resources and available transportation. Specifically, Auburn is working with school districts in Coosa, Russell, and Lowndes counties as part of its turnaround program that is based in both research and experience. The program includes a turnaround internship, which allows students to spend time in schools that have experienced a turnaround, and to work directly with the successful principals who led those efforts. Graduates from the four-semester program leave Auburn with a Master’s in Educational Leadership and a “Turnaround Seal/Endorsement” on their certificate. Reames explained that the program is unique, but is very much at the heart of what Auburn does best.